My interesting places are not always in the centre of activity. 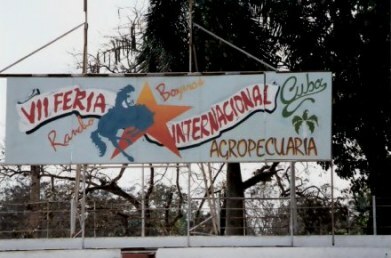 I had seen that there was an agricultural show being held in the fairground in Boyeros on the outskirts of Havana - and so I had to go. Only if you are like me. First clue is that all the information about it is in Spanish. It is meant for people with an agricultural interest – and mine has always been so. The fascination to me is like that of an old fashioned hardware store –there is always something new to discover. 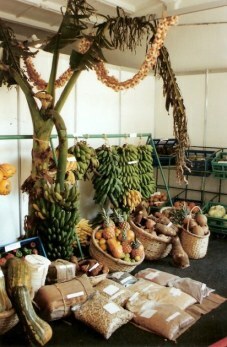 Here there were displays of agricultural produce. In them lay temptations to my Australian palette: mangoes, pineapples, sweet oranges, limes and lemons, bananas, and of course – our staple when we cooked at the apartment in Havana - beans. 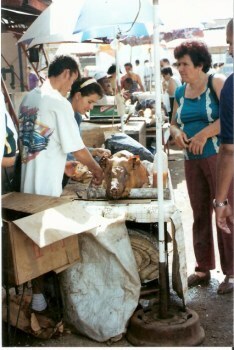 Mangos are Cuba's third most important tropical fruit. As someone who lived for a time in Tropical Far North Queensland, I know that there is a lot of business done 'in mango shade'. The huge trees provide welcome relief from tropical sun. With the rise the agricultural gardening movement that followed the loss of the Soviet market, composting beds are often located in the shade of the mango tree - giving the plants shade but also benefiting the tree. Ciego de Ávila, the province in central Cuba, has a plan to plant 10 thousand hectares (bout 24,710.5 acres) of tropical fruits by December 2020. Apart from assisting in the replacement of imports, the program aims to redress some of the damage done by Hurricane Irma. Irma was a devastating hurricane that originated in Cape Verde in 2017 and by the time it arrived to make landfall on the Camagüey Archipelago on the north coast of Cuba, it had sustained winds of 270 km/hr (165mph) and it drove wwaves of around 5 metres high ( about 16'). 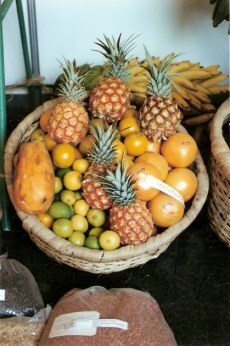 With all this increased effort, I imagine that by now the displays of tropical fruit at this annual fair would be even more spectacular. We bought some popcorn from a typical popcorn vendor - the popcorn being served in small paper cones. 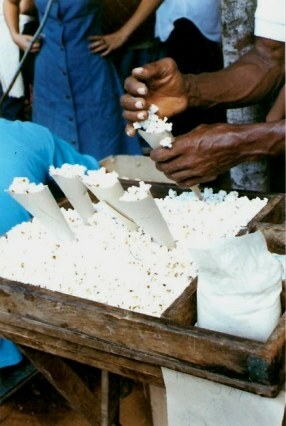 You see the popcorn vendors often by the bus and ferry stops and along the Prado…but oh! How I longed for butter and salt! We were getting hungry as we wandered and so stopped for a pork sandwich, the pork freshly cut from a barbequed suckling pig. 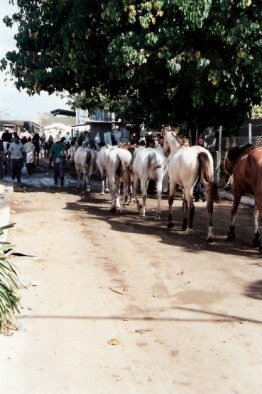 We followed these horses, linked with rope by tail as they were led back to the stalls. The Creolia with heritage from Arabian, Saddler and Morgan bloodlines. The big eyed Cuban Paso with its small elegant head and ears - and the Cuban Pinto reflecting its Quarter Horse bloodlines. 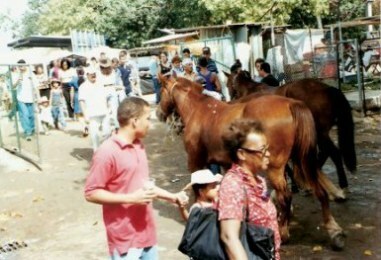 Having had Quarter Horses myself I appreciated the ability to be around these elegant and well cared for animals. Despite the old joke: “Why would you have a Quarter Horse when you can have a whole one?”, I have a long lasting respect and love of these stout-hearted animals and their loyalty. 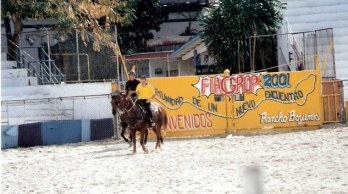 Quarter Horses are a joy to watch working, for their intelligence supplements that of the rider. 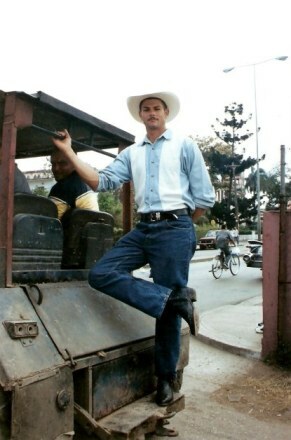 … and found my cowboy riding on the back of a jeep. He was very elegantly attired, and with the most stylish of cowboy boots. Given his pose it would have been rude not to notice, but even so, I would have had to take a picture of these boots! Where there are cowboys there are saddles, and Cuban saddles are works of art, as I saw when I got closer to this tethered horse outside the well-kept fair barn. 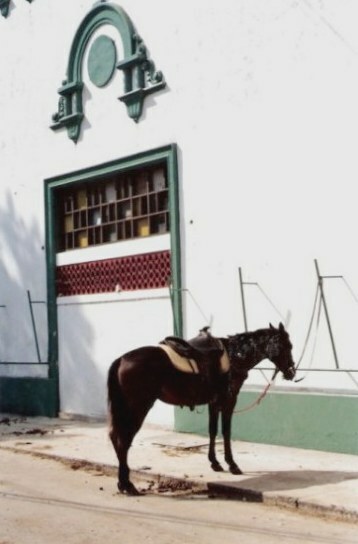 The craft of the “albardeiro” or saddler was well displayed here. 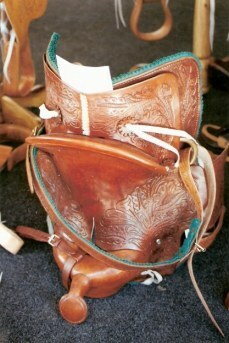 The saddles are usually lined with pig, cattle, or horse skin and sometimes decorated with small woollen flowers. Thesewere saddles for the working stockman. …and this more elaborate affair was a saddlery work of art in itself. Ideally, a saddle should be made for the particular horse, as it’s main function is to distribute the weight of the rider over a wide area of the animal’s back and to have the rider at the point of balance. 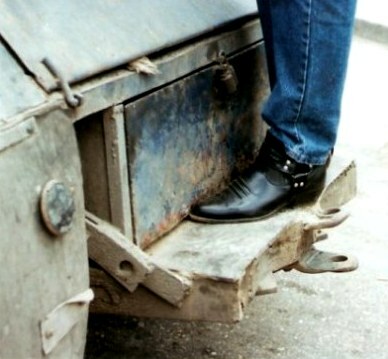 However, like footwear for people – saddles are more often manufactured en masse. In saddles, the sizes are more generalised- basically being either narrow, medium, or broad and having one of four lengths. The skirts, designed to protect the rider from the horse's sweat and to cover the girth, were here beautifully tooled. The smaller straps provide for carrying canteens, weatherproofs, etc. 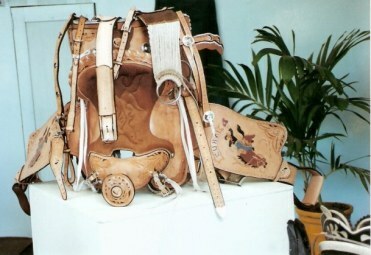 The display provided a few examples of Cuban stock saddles – all beautifully crafted. 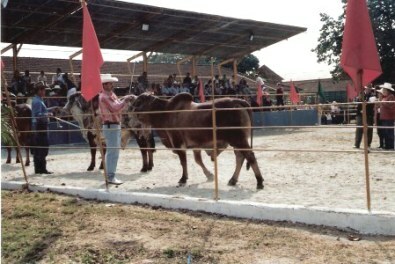 But we were aware that the judging of the bulls was beginning, and hurried over to the arena. 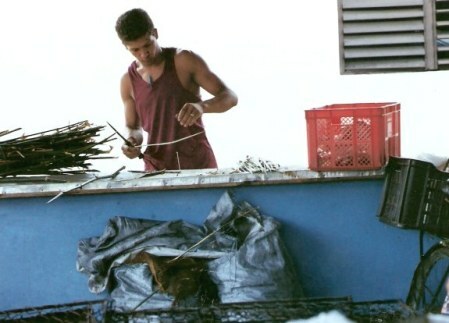 We had a quick look, but decided to head back into Havana where we were to meet some friends, but before doing so, sought out something else to eat. 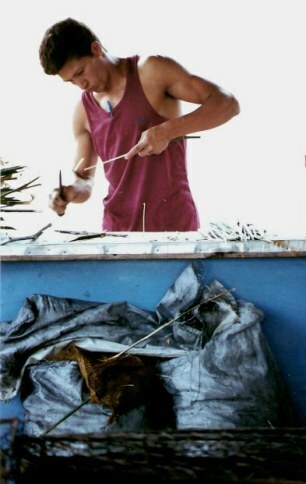 Here, there was clever production line underway, this man sharpening reeds to use as skewers. He had obviously cut bags full of reeds to bring to the fair, supplementing his income by making best use of what was available. 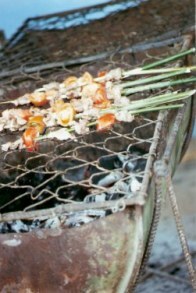 The skewered kebabs were then grilled over a piece of wire fence laid over half a 44 gallon drum barbeque. 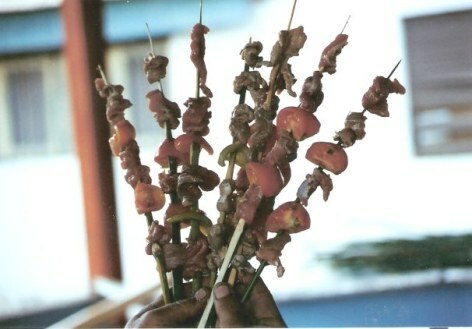 Once cooked, these kebabs formed a mouth-watering selection from which to choose. We started walking, munching our kebabs as we went. A vehicle approached and was duly waved down by my friends.This is a common occurrence in Cuba. Strangers readily provide rides to those who hail them. 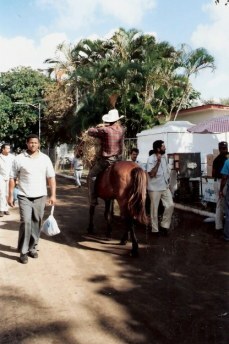 Swallowing the last mouthfuls, we crammed in and were whisked back to Habana Centro. My companions had an unending capacity to enjoy the moments of each day, yet have so little in material wealth.